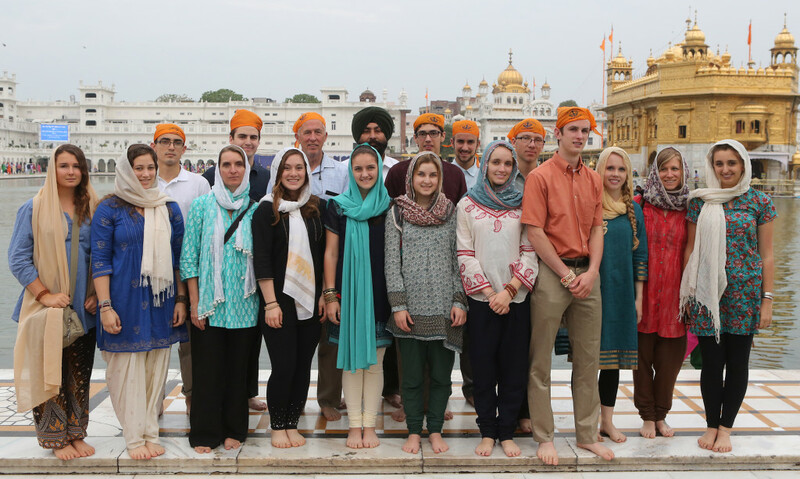 Below are some reflections from the students after returning from India. Click the title of this post or the read more button to see all of them. I haven’t figured out how to go on from India yet, and I don’t think I ever will. Like a hand pressed into cement, India has left a permanent impression on my heart, a stain that can’t be blotted away or forgotten. I look in the mirror, and I don’t see the me that left for India three weeks ago. Instead, the image I see is not of a single person, but of an entire nation. Embedded within me are the Indian people, for they have stayed with me even as I have flown back across the ocean. 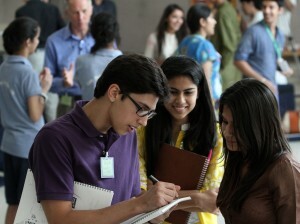 In the people I met, and even in those I didn’t, I found a power that is unlike anything else I have ever experienced. I fell in love with their truths, their beautiful vulnerabilities that lie so clearly displayed and unpolished for the world to see. And above all, I fell in love with the love I both received and witnessed. 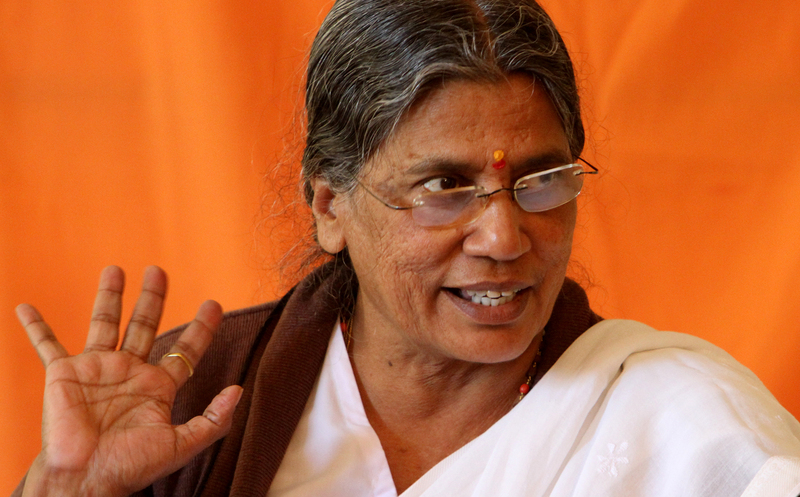 Whether it was the love of someone like Dr. Metre, who has dedicated her life to help rural villages, or the love of the Sri Ram Ashram kids, so unconditional and pure, India opened my eyes to the sheer magnitude of what love can do. It can heal, protect, save, rejuvenate, and above all, bring light to the darkest of times. 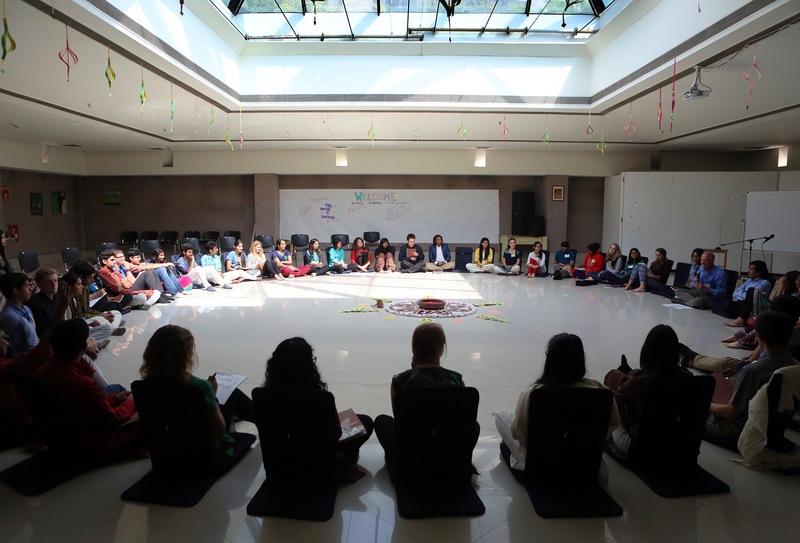 India has taught me how to love, and as I slowly reintegrate back into life in this hemisphere, I intend to bring that gift with me wherever I go. Gratitude is a common takeaway from immersion into a developing nation. Through my experiences, I learned just how lucky I am, and that I should be thankful for everything that I have. However, as I have described it, gratitude sounds like a debt that should be paid, instead of an ideal that everyone should strive for. After all, it is people who are grateful that are happy, not happy people that are grateful. I can’t count how many times I’ve given thanks to my parents for the little things that I used to take for granted since I’ve come back from India, and even though they say that I don’t need to express gratitude for every little thing, it really does make me happy to let them know that I appreciate what they are doing for me. I only wish that one day I can repay them. This trip was an absolutely worthwhile experience for me. It has made me significantly happier, and the exposure to the culture, history, people, and ideals of India have helped me develop myself in new and improved ways. I woke up at the more reasonable hour of seven, and looked out the window into the inescapable beauty of the Indian mountains. I suited up and was off to breakfast. We were happy to get a break from the repetitive Indian breakfasts and I could feel the contentment oozing out of the smiles around the table. After breakfast it was time to leave our gracious sanctuary and enter the world outside of Dharmashala. The taxis with “Tourist Vehicle” decorated around the outsides of them were waiting for us… well most of them at least. 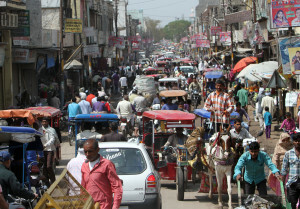 After we waited for one late driver, the always exciting, and miraculous adventure of Indian traffic started once more. Cows littered the streets surrounded by stray dogs, all managing, surprisingly, to stay unscathed from traffic. The symphony of car horns and street vendors poured into our car from outside. Weaving around crowds of people and buses three times too big for the road, we headed towards the Dolma Ling Nunnery, the destination of our second interview, this time starring Rinchen Khando. As we slowly made our made way to a more dense part of town, my eyes caught sight of something glorious, the Himalayan Mountains. I had caught a glimpse of them on the way up, but the thick fog hid most of the wonder from me. Today the fog was gone and the Himalayas stood tall, white, and in full glory. The snowcapped mountains disappeared as we drove further, but the image remains imprinted in my memory. We finally reached the Dorma Ling Nunnery and set up for another memorable experience. 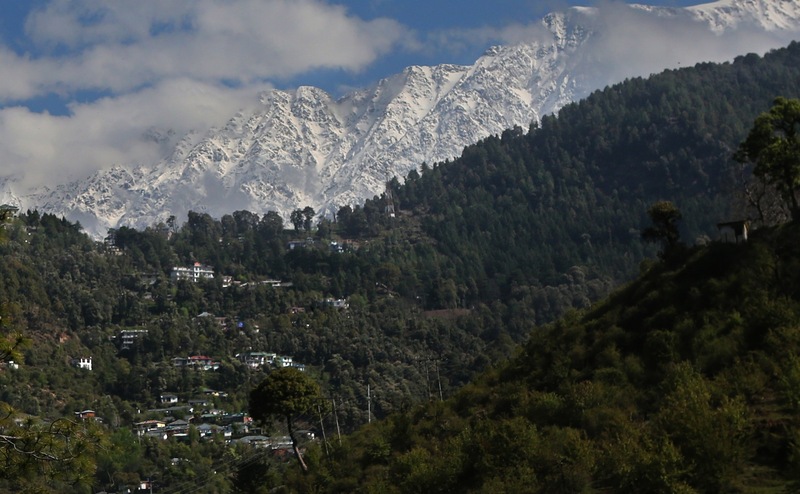 If I ever find myself back in India, it will be because I am in Dharmashala. Going to Dharmashala was my favorite part of the trip for a few reasons. First, the view from anywhere we were standing was amazing. It’s hard to complain about anything when the Himalayas are on one side and the rest of Dharmashala is laid out on the other. It reminded me of the view we have from the overlook at Mount Madonna, only with scattered red roofs and mountain ranges instead of an ocean below. Along with the scenery, we were treated to the freshest and most crisp air. This made even the simple task of breathing an experience. 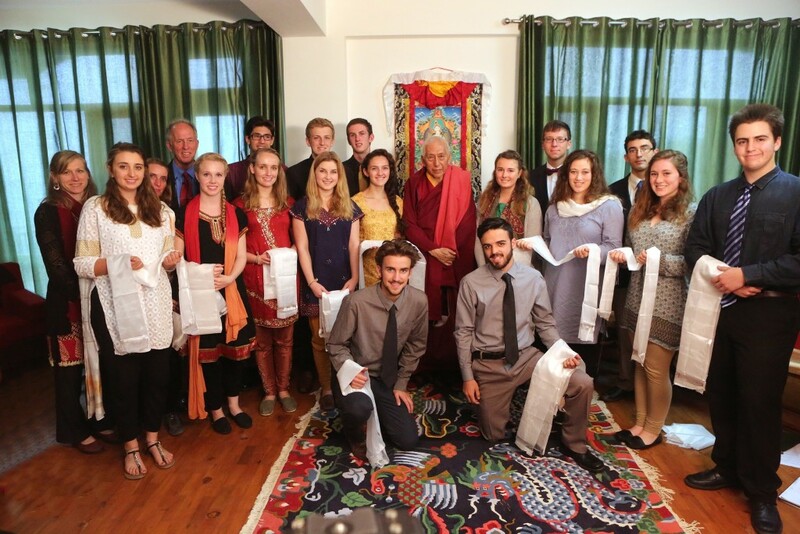 Although we didn’t get the chance to interview the Dalai Lama, we did visit the compound where he stays. It was amazing to see the various rooms dedicated to prayer and the elaborately decorated statues. When we finished our tour, we stopped to listen to the monks pray. It was unlike any prayer I have heard before because their chanting was staggered, creating a haunting and yet comforting melody. Walking back to the hotel, we perused the shops. 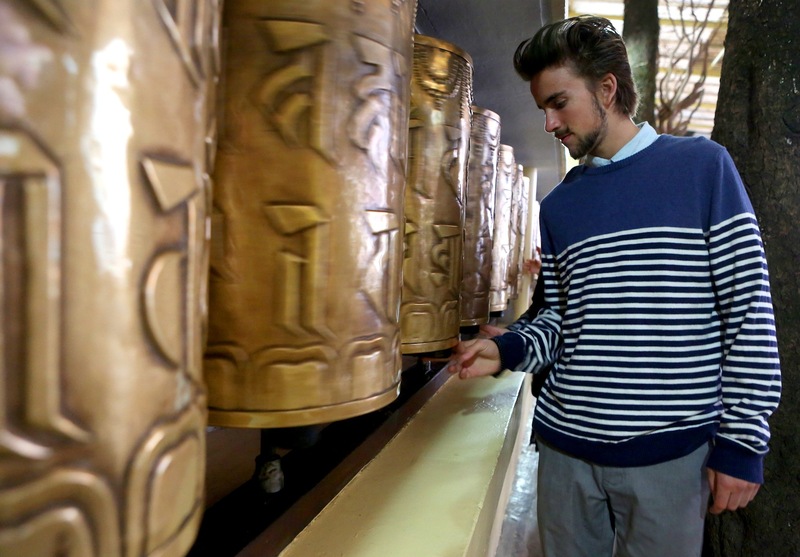 There were things ranging from yak wool scarves, to anklets, to rustic looking padlocks. I was thrilled, of course, and bought much more than I should have. While the shops broke my wallet, the interviews broke my mind. 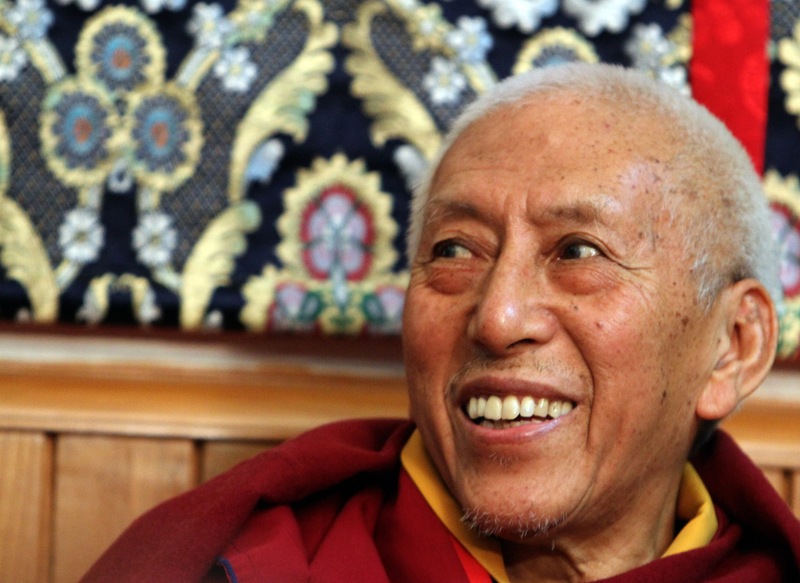 My favorite of the three interviews was with Samdhong Rinpoche. His responses were extremely thoughtful. He was insightful, and I will remember what he said to us for a long time to come. Dharmashala was relaxing, fun, and one of the most memorable places of the trip. I hope I return someday soon so I can spend more time there. In his book Man’s Search for Meaning, Victor Frankl constantly repeats the phrase, “Everything can be taken from a man but one thing: the last of the human freedoms—to choose one’s attitude in any given set of circumstances, to choose one’s own way.” Rinchen Khando, the founder of the Dolma Ling Nunnery, is one of few people that truly embody this sentiment. As a Tibetan Refugee she realized early on that it is detrimental to living a full life to allow oneself to create a victim mentality around one’s experiences. 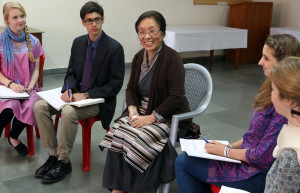 From the founding of her organization, the goal was never to create a place for nuns to just live; Rinchen Khando wanted to create a place for nuns to live, study, and learn the skills necessary to fully support themselves. In her opening statement she made a point to say, “Save Tibet. But more than that, contribute something to society.” This objective is extremely admirable to me because she, and the women that she works with, have not only escaped the trap of victimization, but feel that it is a necessity to give back to the community that took them in. Another statement that struck me was, “Don’t think we are really happy here. But smiling is better than crying.” It was deeply inspiring to hear that after fifty years of exile, the most imperative goal is still to go back home to Tibet, and that while the struggle to free Tibet still rages on, the refugees have managed to find happiness, despite the adversity they have had to endure. Since reading Victor Frankl’s book at the beginning of my junior year his message has stuck with me. 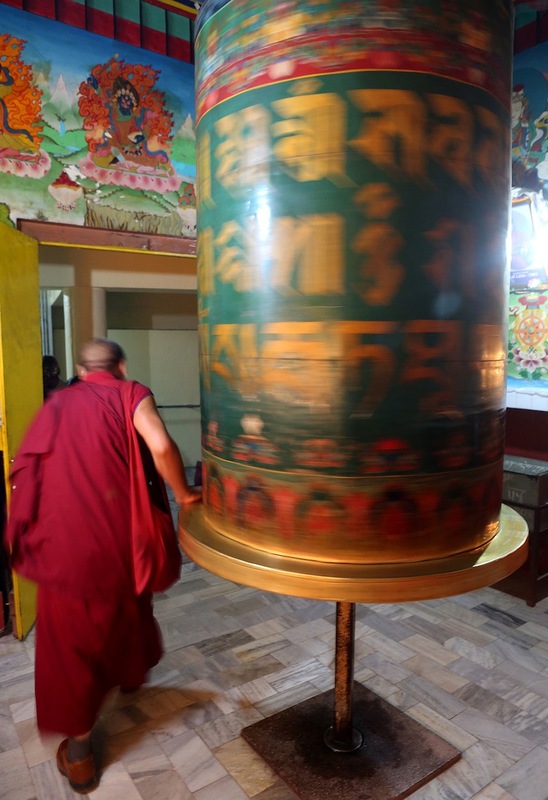 Seeing his views brought to life in Rinchen Khando was an awe-inspiring experience. While maintaining a humble and gentle demeanor, she is able to convey a strength of character and willpower that I have never seen in anyone else. “No matter what you say it is always the stronger that wins, isn’t it?” Rinchen Khando asked us this question toward the beginning of the interview. I didn’t expect her to say that. 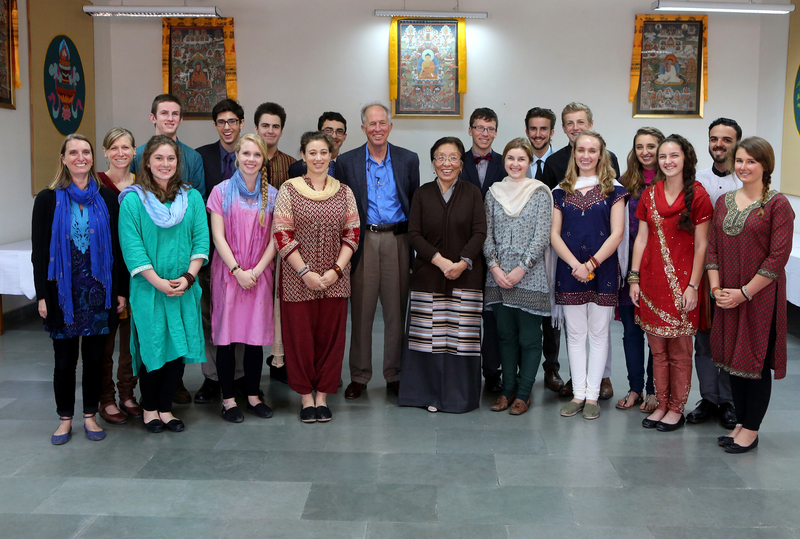 I could tell from our research and our time with her that she felt very strongly about protecting and conserving the Tibetan culture. A whole nation of hardworking, harmonious Tibetans, that are caught in the dilemma of making a home in India and trying to make a way back to their home. They are like a bunch of peaceful seagulls caught in an unwelcoming storm. Having been away from Tibet for three generations, the Tibetan people are having trouble keeping their culture alive. 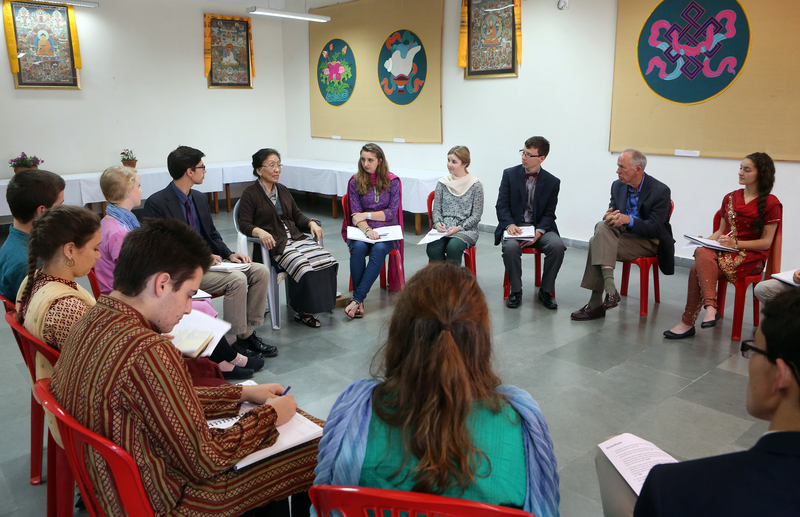 With an upbeat, realistic demeanor that truly shows the pain and everlasting service to her country, Rinchen Khando said that the struggle will go on for a much longer time. I could tell from her tone during the interview that she is a person of action. The way that she approached every problem is the necessary approach that the Tibetan people need. At the beginning of the interview I thought that her statement about the stronger always winning was a reference to the superior size of the Chinese army. What I realized at the end of the interview was that she was talking about the unifying mentality of the Tibetan people. It is like the strings in a spider web. We drove up the windy dirt roads, leaving the smog filled city behind, heading towards the glistening white mountain-tops of the Himalayas, finally reaching Dharmashala. In Dharmashala we had the pleasure of meeting the Dalai Lama’s sister in law, Rinchen Khando, the founder of the Dolma Ling Nunnery, an organization committed to educating and supporting Tibetan nuns living in exile. This extraordinary organization’s ultimate hope is to preserve the unique Tibetan traditions and culture, while they are living in exile. Rinchen Khando started this project because she wanted to provide facilities and opportunities for Tibetan nuns. Her dream is to help create an environment where the scattered culture can be preserved and thrive. 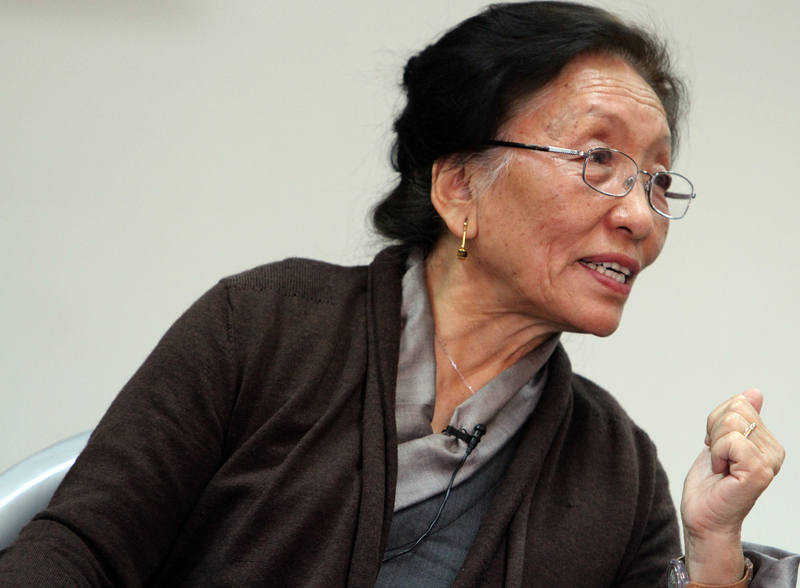 Through my research, I could tell that Rinchen Khando is an exceptional woman. After speaking with her for just one short hour not only did she exceed my expectations, she left me thinking about priceless concepts and values that continue to flood my already overwhelmed brain. Rinchen Khando spoke of the absolute devotion and dedication that she carries for the Tibetan culture. We were curious how a culture could continue to grow even after so much devastation, so we asked her about it. She said that the Tibetan culture is something that is carried through the people, not necessarily the place that they call home. Culture is expressed through thoughts and everything must come from within to truly embody the meaning of culture. The amount of hope that Rinchen Khando expressed for a possible free Tibet demonstrated strength and courage. 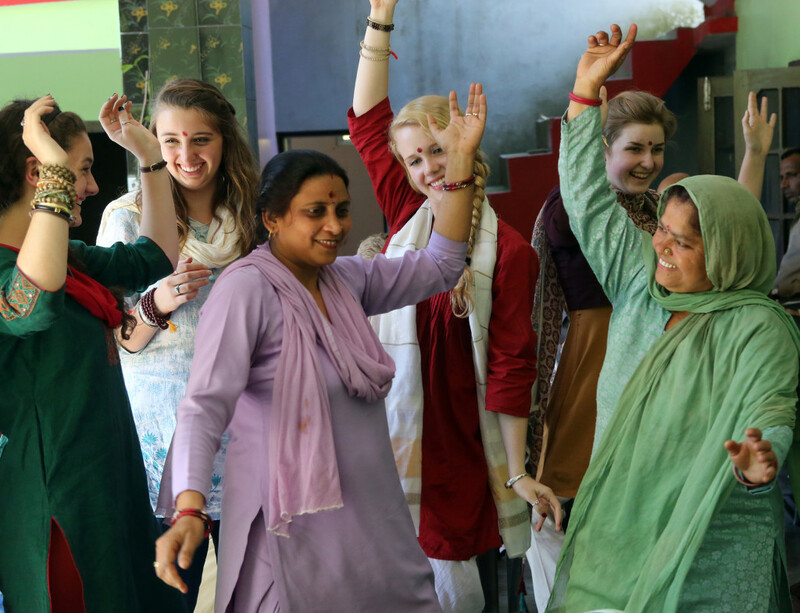 She takes this hope and provides a sanctuary for those living in exile, as well as the opportunity to become empowered, and discover their own dedication and motivation to continue to thrive. During our interview Rinchen Khando said, “It is not worth crying over suffering.” This exemplified her positive energy and her ability to overcome adversity. She does not allow anything to get in the way of her preserving her culture and assisting others in that same quest. The strength Rinchen Khondo demonstrates in her approach towards life, and the situation that she has been faced with, is inspirational. After hearing her story and learning about how she responded to the hardship that she and many others are facing, I have been inspired. I now know that you can approach even the hardest things life throws your way, with humility and happiness. 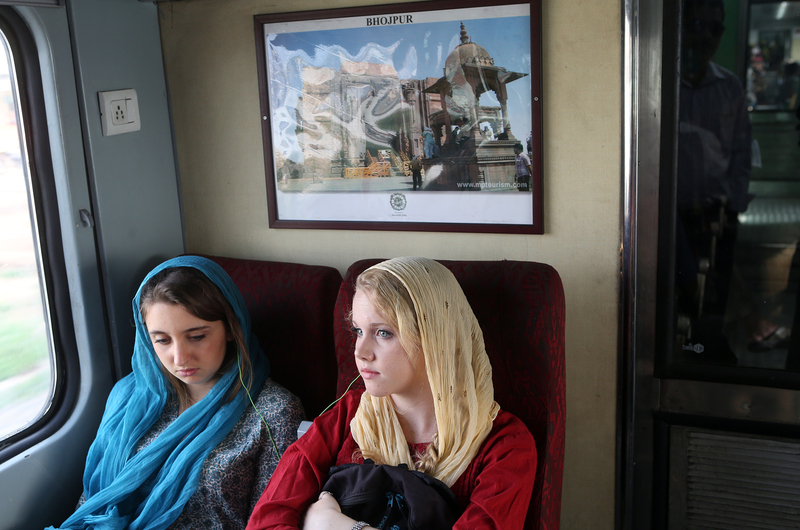 Everyone told me that India was unexplainable. In the months leading up to this trip, I was told over and over to abandon all preconceptions and expectations because I couldn’t possibly comprehend the new world that I was about to enter. So that’s exactly what I did. I left all of the stories, hopes, and fears in California and prepared for the unknown. When I stepped out of the airport and into the humid Delhi night, I new immediately that I had been correct to do so. The sights, smells, and sounds around me were only a tiny taste of what I would later experience, but it was instantaneously apparent that I was in a very new place. It was three in the morning but the streets were still full of cars honking and swerving to avoid collisions. Sleeping figures lined the sidewalks, and I even saw a few kids scampering around barefoot. I stared out of the bus window, trying desperately to take it all in. The city was alive and it seemed as though it never slept. Our bus and train rides have given me the opportunity to see a whole new side of the country. 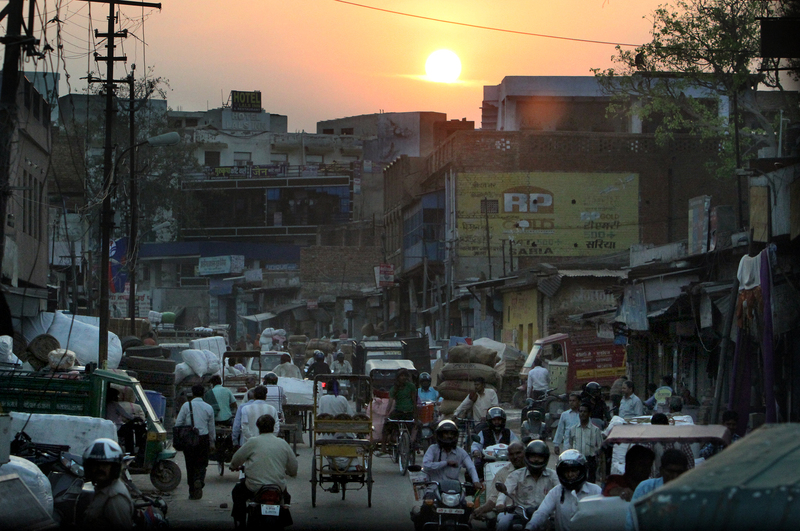 As Delhi faded away into the distance, rural India materialized around us. 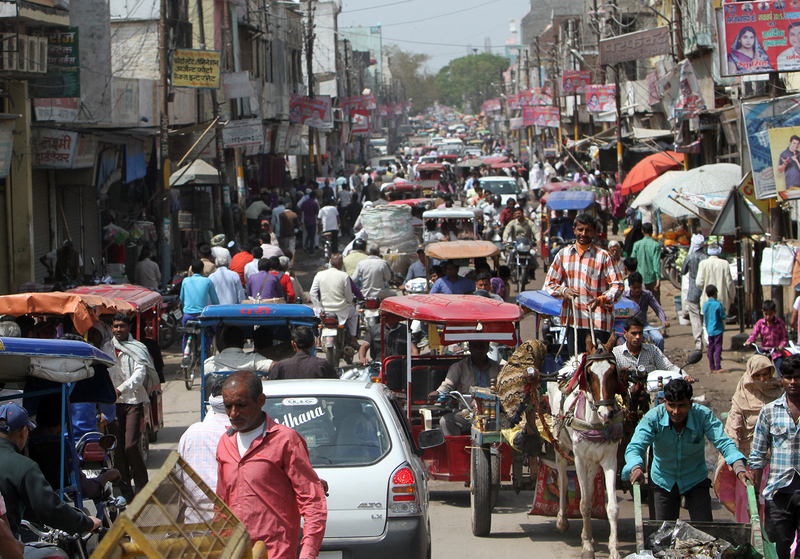 In India, the big cities are home to massive quantities of people. 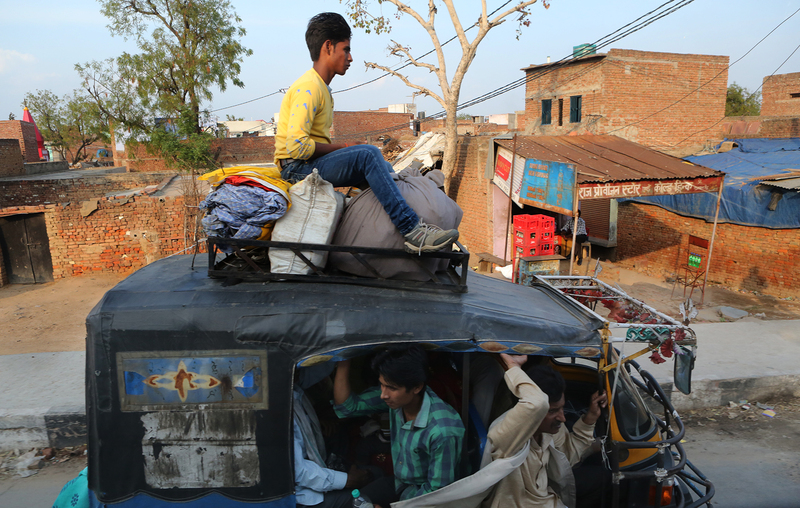 Delhi has 16 million residents. However, most of population of 1.2 billion people is made up of those living in rural villages. From our window we got to peer into the daily lives of those villagers. The first thing I noticed was the color. Everywhere I looked, there was vibrancy. Women carried bundles of cloth on their heads, garbed in bright saris of pinks, blues, and greens. Street vendors pushed carts bursting with ripe, yellow bananas and orange papayas speckled with black seeds. Bright flames dotted the fireplaces outside of the rows of dusty huts. Stout buildings with pastel paint stood out against the agrarian backdrop. It was a feast for the eyes; you couldn’t look anywhere without a splash of color catching your attention. As we drove along, men and children ogled and waved as we pressed our faces against the glass. Monkeys lined the roofs of the buildings outside. Little kids pumped water and splashed around. The roads were even more chaotic than the ones in the city; any attention to traffic laws vanished, plunging our bus into a ride that rivaled that of the Knight Bus from the Harry Potter books. In addition to cars, cows and carts now clogged the roads. This drew my attention to a common theme threaded through most of village life: the juxtaposition of old and new. 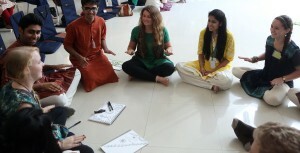 All of the women I saw were draped in saris with bindis dotting their foreheads and bangles gleaming on their wrists. The men chose a more modern route: jeans and tee shirts. We passed fields stacked with cow patties and huts made out of dirt and straw, only to turn around and find a Coca Cola billboard staring down at us. Farmers lumbered up the roads on cows while shiny motorcycles zipped around them. It was unlike anything I had ever seen before. 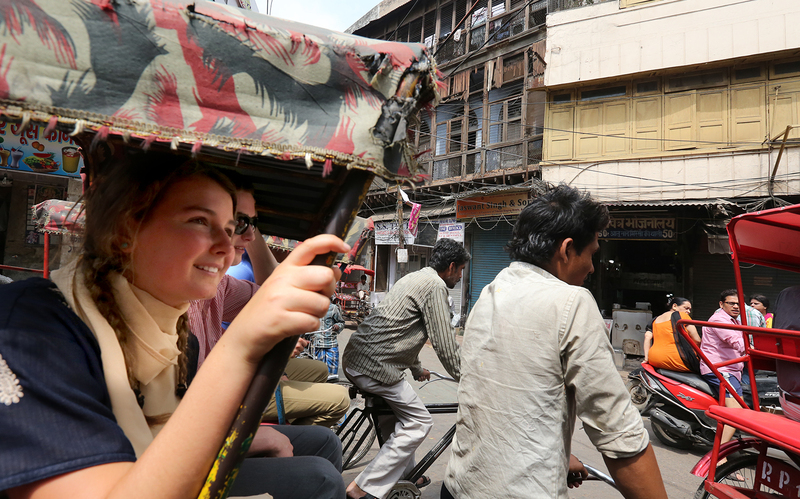 All of the people that talked to me about India before this trip were correct. There is no comparison that could truly encompass the life that goes on here. Everything is so lively and vibrant. It is the kind of place that if you blink you will miss something. I hope that I can continue to absorb as much of it as possible. 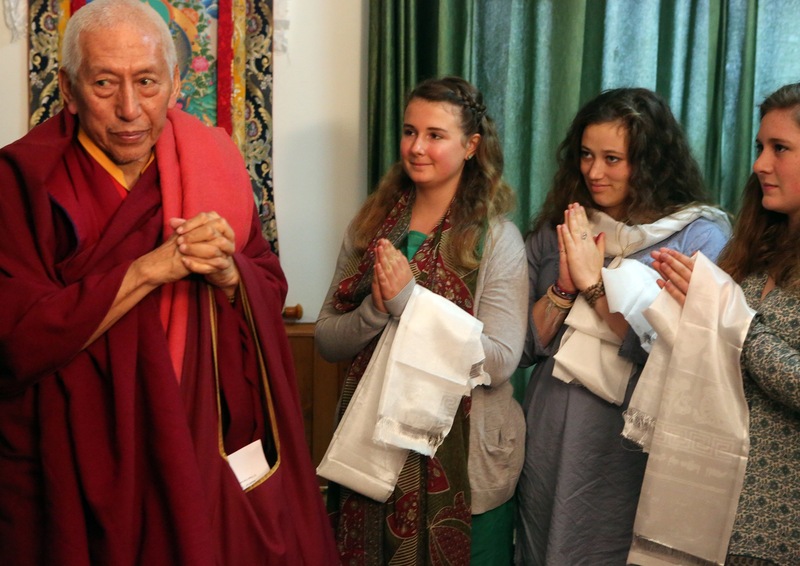 Samdhong Rinpoche entered the room and his presence gave off a feeling of humbleness, wisdom and elegance. From the start, I knew that this man was going to be interesting. He spoke slowly, taking each word into account. We could see him analyzing every sentence, triple checking the words in his head, like one would when writing a school paper, before sharing their answer with the class. These were just some of his mannerisms; he was a calm, knowing and interesting individual. I hope I have painted some sort of picture by describing the important details of this remarkable man. A picture is worth a thousand words, and I would say that Samdhong Rinpoche’s words were filled with such meaning that they were worth a thousand pictures. He spoke of education, mindfulness in one’s actions, and knowing what is true vs. what is assumed. The comment that particularly struck me was, “Know the limitations of an ordinary mind, then cultivate and strengthen your own.” I understood this to mean that ordinary is merely a state of mind; it is a choice. This acknowledges the progression into the extraordinary for those who wish to seek that realm of mind. Patience, meditation, mental and physical exercise, and positive action, in every sense of the word, come together in order to bring each individual into the extraordinary spectrum in consciousness and strength of mind. Something I have been struggling with for quite some time is the concept of mindfulness. It is a word I hear almost every day in values class, and increasingly it is brought up in all contexts of society. “Be mindful of what you eat,” “Be mindful of what you say,” the list of mantras goes on and on and on. But what I have never been able to grasp is how one can possibly achieve true mindfulness, to become fully aware of one’s thoughts and understand the consciousness that makes us into who we are. I want to be mindful, yet I feel that I do not know how to be so. Today, I had the opportunity to bring this question to a man who has spent a lifetime unraveling the secrets of our inner consciousness, and I was finally able to find peace in an answer. Today we went to the Golden Temple in Amritsar, the holiest place for the Sikhs. As we neared the temple compound the streets suddenly transformed from the cluttered dusty streets we had grown used to, to clean and shiny tile. Before entering the enclave that surrounded the temple, we took off our shoes and socks, covered our heads, and cleaned our hands and feet. Finally, we joined a huge line heading slowly to the temple far in the distance. 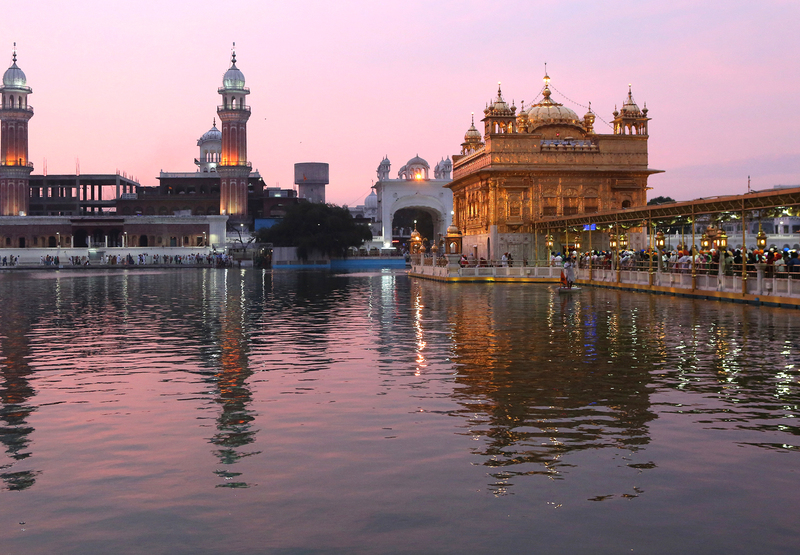 The Golden Temple, as its name suggests, is covered in tons of the purest yellow gold. When we finally entered the temple, it was truly a site to behold. The temple was made largely of gold and white marble, and surrounded by a large pool of water. It was amazing to see people from all over the world, inside their most holy place. These people were experiencing something that most, if not all, of us will never understand. I saw this first hand when I moved to let an older woman through. She turned to me, pressed her hands together, and gave me a huge hug. It was truly beautiful. 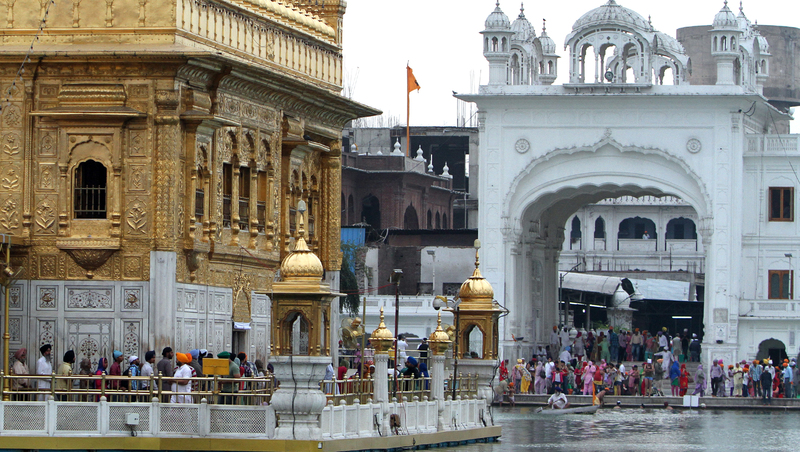 We left our hotel in Amritsar at 5:30 am so we could beat the crowds at the Golden Temple. Despite our early rising, there was already a huge cluster of people waiting to enter. As we stood in line, shoulder to shoulder with strangers, we struggled to stay awake. We were functioning on only four hours of sleep and no food. It was impossible to fall completely asleep in line because every so often the entire crowd chanted a prayer. It felt like we were a flock of flamingos, trying to blend into a world full of peacocks; we were easy to spot and it was clear that we didn’t belong. People around us pushed through the confined space just to get one step closer to the temple. After standing for one hour, with absolutely no elbowroom room, breathing in the chilly morning air of Amritsar, we finally got to take our first steps into the Golden Temple. Even though the crowds were moving at a more comfortable pace now, the temple was still packed to the brim. The temple was small but beautiful. The ceiling was gold, and as your eyes traveled down you could see that you were standing on white marble. As we were led upstairs to the second floor, there was yet another crowd of people surrounding a man who was reading the Granth Sahib, the holy scripture of the Sikhs. 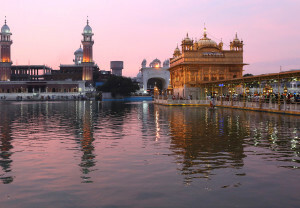 The Golden Temple was a vivid visual of Sikhism. Sikhism revolves around monotheism, the belief in one god, and the all around equality of both men and women. 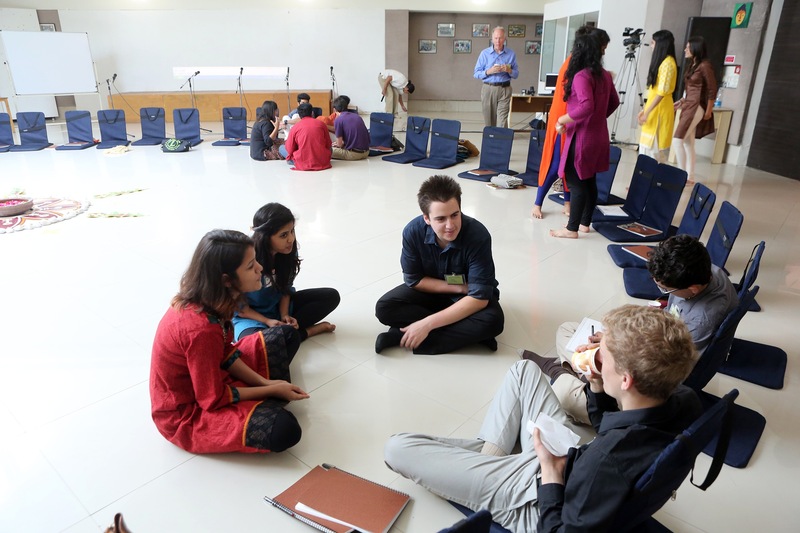 In this circumstance, segregation of the genders was not much of a concern, as it so often is in India. 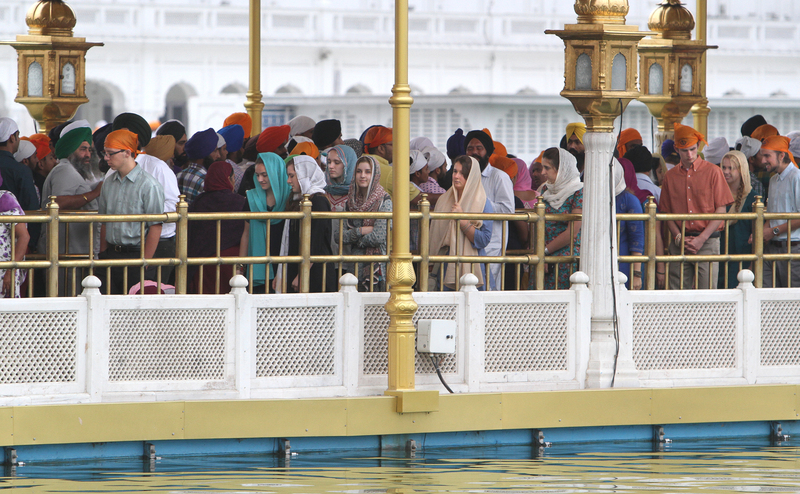 It blew me away that so many people came to stand in a line, where personal space was non-existent, just for those few precious moments in the Golden Temple. The people were there for their religion and belief. It was very eye opening to witness this kind of devotion. 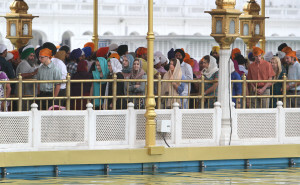 I have not seen what we experienced at the Golden Temple happen in America, over religion. 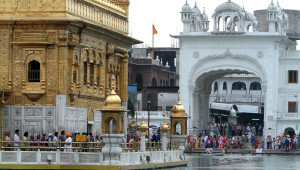 Although it was difficult to wake up so early to go to Golden Temple, I am certainly glad that I did it. This experience made me realize that it isn’t always about your joy and comfort, sometimes it’s about observing what brings joy and comfort to others. In turn, you might figure out what you are willing to do for what you love.